‘Tis the season for planting in the Midwest and many other parts of the U.S. Besides having crops to care for, like many of you, I also have a garden. Did you ever wonder what goes on when we put that seed in the ground? I recently started thinking more about that after helping some elementary students plant seeds so they could watch them sprout and grow. I love sweet corn and it is the easiest vegetable in my garden to care for. Did you know that corn is a member of the grass family? 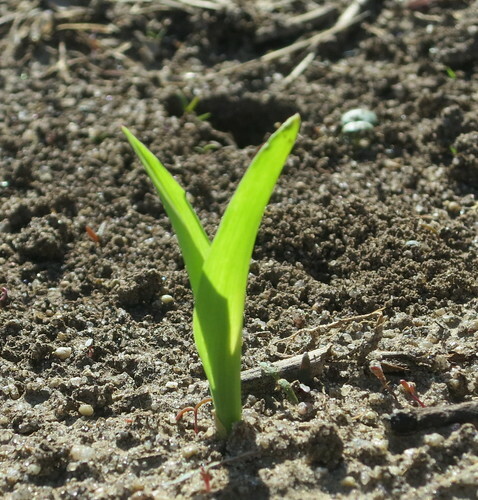 As the corn plant emerges from the ground, it does resemble blades of grass, doesn’t it? Corn was domesticated from a wild grain several thousand years ago by Aztec and Mayan Indians in Mexico and Central America. The early corn resembled a wheat head with small kernels covered by a hull. Eventually corn spread into North America with the early colonists quickly learning how to grow and eat the field corn in flour as well as feed it to livestock. Cross pollination developed to increase varieties for flavor, disease resistance, drought tolerance, yield and more. Today there are thousands of varieties of corn with 200 varieties of sweet corn alone. As the seed sprouts, it sends down a taproot and starts to develop its first leaves. 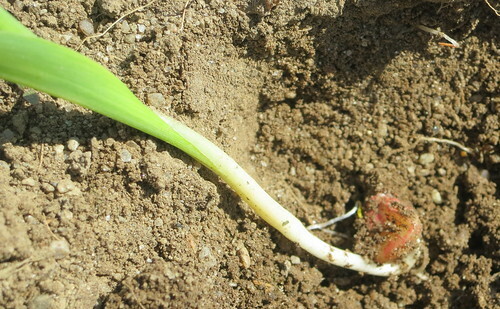 (see corn sprouting picture) The seed will use fertile soil, moisture and the sun to grow. In the picture you can see small white strings, or roots, coming from the seed as well as the shoot that emerged from the seed pushing up through the soil to form the first leaves. As the plant grows it will eventually develop tassels near the top. Those tassels are the male parts of the plant that will pollinate the female parts which are the silk strings of what will become the ear of corn. Each silk corresponds to a single kernel and must be pollinated to form that kernel. Over the past one hundred years the American farmer has worked hand-in-hand with nature to develop varieties that would astonish the Aztec and Mayan people. Aside from giving seeds the ability to grow with less moisture, fight off bugs and increase resistance to disease, farmers have increased yields. In 1962, a little over 4 billion bushels of corn were produced with one farmer producing enough food for 26 people. In 2010, more than 12.4 billion bushels of corn were produced with the American farmer feeding 155 people. This tremendous growth has allowed corn to be used in new ways, including ethanol, fibers and bioplastics. As a farmer and a gardener, I appreciate the work that goes into developing new seed varieties. I look forward to finding that “sweeter-than-sweet” new sweet corn variety in my garden. I appreciate the ability of those little seeds to genetically fight problems so we don’t need to use as many chemicals. So until harvest time arrives, I am singing the tune “Let it grow, let it grow, let it grow”.